Soooz Says Stuff: Book Review: In the Garden of Stones by Lucy Pepperdine. 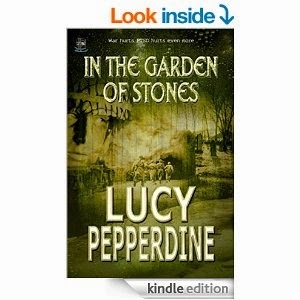 Book Review: In the Garden of Stones by Lucy Pepperdine. Grace Dove is a borderline bipolar depressive who not only attempts to take her own life twice, but goes through the medical gallows into the dark halls of electrical-shock therapy - drugs - and psychiatric treatment. She could assign blame but instead decides to try Doctor Malcolm Petitt's unconventional treatment. Sent into her spiritual self, Grace finds herself crossing logical borders into the profound realm of Colin McLeod's imaginary garden, finding him hiding there in a safe haven of his own making. She is drawn to him, spending more time in the spiritual ether with her soulmate than in the living world. These two wounded hearts find solace in each other, their friendship blossoming into a physical real world connection when Grace goes to meet the war soldier suffering from catatonic post traumatic stress disorder. It's no longer a war on the battlefield, now the war is to draw Colin back into society and human interaction, before the doctors do something so drastic it may end up killing him. Grief and pain destroy boundaries, helping Colin is healing Grace, and now she's desperate to help him heal too. This is an intense Scottish journey into the mind of post war trauma, into a connection between two people which builds a bridge of love. The hardest action for the wounded is to surrender to hope, to dare to take the first step on the long path of recovery. Colin and Grace will immerse you into their lives, into their wounds, exposing their vulnerabilities and flaws, leaving you forever grateful for the experience. Lucy Pepperdine … Author of ‘In the Garden of Stones.’An author I will seek out again and again. If you are seeking a book that will imbed itself into your memory, a powerful, inspiring, memorable, painful yet often funny emotional roller-coaster of a book … this is it. The author has taken me on a journey with her words, a journey that was at times exhausting because it is brutally honest. The empathy that shines through this work, that connection the author has with Gracie and Colin her pivotal characters reads at times like non-fiction, the shattering expression of mental illness and its devastating effect on all those touched by it is not sugar coated. Yet throughout the book a message of hope shines through. I found myself invested in the characters well being, I laughed with them, cried for them and cheered them on in their quest to make sense of a senseless world. The interaction of others is integral to the book, there are no superfluous characters. Author Lucy Pepperdine has not merely written words on pages … she has opened a window into a half-life that so many people merely exist in. A life where all that is craved is a safe place to be. The author crafts that place with integrity, allowing the reader to become a part of that world, permitting us to visit without judgment. This book hits at gut-level. I will not forget it.